PodTrans is a free and versatile iPod music transfer software which specializes in iPod shuffle, iPod mini, iPod nano, iPod classic, and iPod touch files management. It is an unparalleled iPod transfer software that allows you to transfer almost all iPod media files to PC/Mac and vice versa. 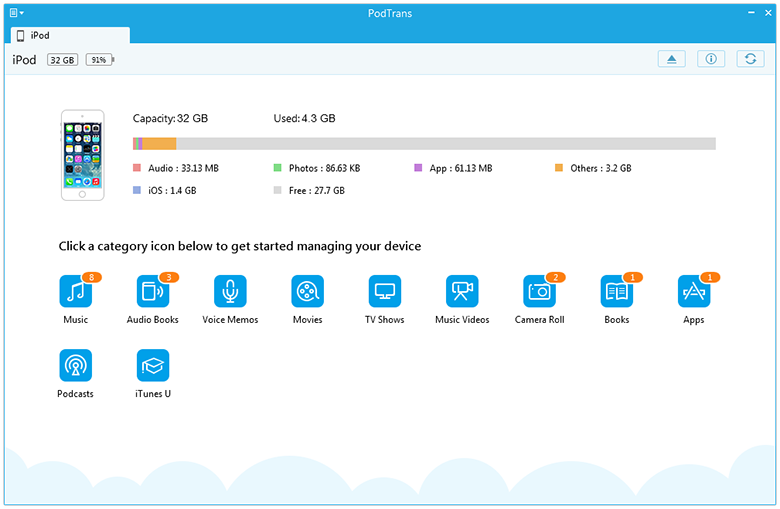 With PodTrans, you can transfer songs to your iPod without erasing the existed data which brings you a free and simple way to manage your iPod content. 1. It is a simple and helpful transfer software which is well-designed for transferring iPod music and everything to & from computer and never erase your original songs. 2. It is the only free iPod Transfer Supports Two-way Transfer. Aiming to providing you with a high-efficient iPod music transfer solution, PodTrans fully supports all models of iPod nano, iPod shuffle, iPod classic and iTouch. 3. It is contrived to transfer other types of media content which used in your daily life, including music, movies, TV shows, videos, Audio books, iTunes U, podcasts, etc. 4. It provides an excellent way to fresh, browse, add and delete the media files on your device expediently.